Is it possible to have the who’s online bar above the sub categories? I’d like to swap the “Category” and “Online” boxes around for the layout to make more sense. I have multiple top level categories that have sub categories, and they have different number of them. This approach can only work for one of them at a time. I think. I’m not a CSS expert. How would I also fix the main page? I think that this is a situation that can’t be fixed with CSS as you would have to somehow query the height of another element tree. Even if it works for now, I’ll always dread the next time I have to update discourse as it might break (I have had a ton of CSS related issues when updating discourse in the past). If you click “Edit CSS/HTML”, you should see a more detailed error. I can’t discern from the above, so forgive me if this is listed and I’m overlooking it. Is there an option included that allows users to disable the online status indicator feature from their profile settings in case they do not wish to have their online status broadcast? It’s a little buried, but yes, they can enable the setting under their “interface” preferences. How cam I show guests online on my forum. This seem not to be available on the plugin. At least the software should be able to show signed in users online and number of guests online. A reasonable idea, but how are we going to name the guests? Is it going to be something like @Guest1? I think this change will take a long time. The essence of having guests numbers is not to have the guests names mentioned but to show that the forum is active.everyone wants to see a forum that is active and majority of viewers are not registered. 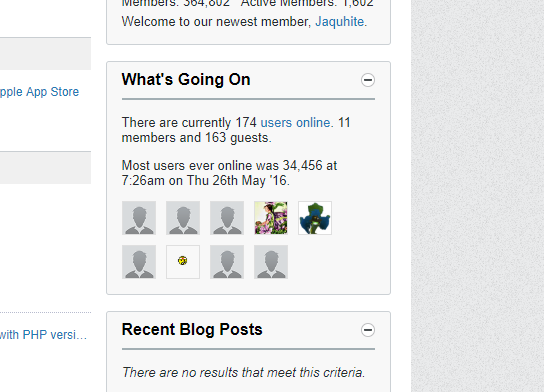 So many forum will show you the users currently online and the number of guests. It will be like this James Stephen Christ and 20 guests online. Very correct. This is what I am talking about. Is this possible with discourse? show that the forum is active.everyone wants to see a forum that is active and majority of viewers are not registered. How to do it on discourse ? ?